My son and I were not feeling that great last week. Since we didn’t really feel like eating anything, but needed to get as much vitamin as we could, I made a delicious, healthy and quick vegetable soup. I don’t know why soup helps you feel better when you’re sick, but it does. And even when you’re not sick, a nice warm bowl of soup is always so good. 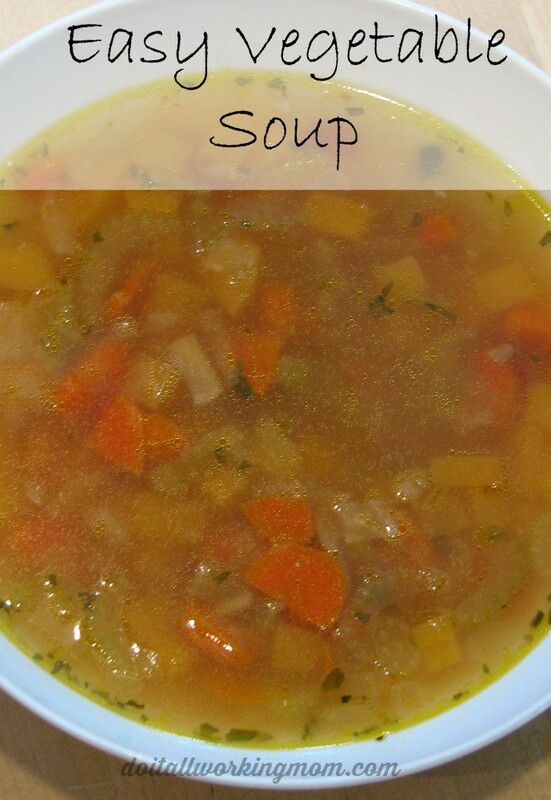 So I’m sharing with you today my easy vegetable soup recipe. 1- In a large sauce pan, melt the butter on medium high heat and sauté vegetables and garlic for about 5 minutes. 2- Add the chicken broth and the remaining ingredients. 3- Let simmer until vegetables are tender. Adjust seasoning if needed. In a large sauce pan, melt the butter on medium high heat and sauté vegetables and garlic for about 5 minutes. Add the chicken broth and the remaining ingredients. Let simmer until vegetables are tender (about 30 min.). Adjust seasoning if needed. I love homemade soup! Why don’t I make it more often? Yours looks so delicious and comforting, and we already have Knorr soup mix in the cupboard. 🙂 Must try! For sure it’s a must try. You’ll see it’s so easy, you’ll make it more often. Love this recipe, lots of vegetables. So healthy! Yes it’s really healthy and yummy! I agree there is something about soup, but i love homade even more because you can control what is put in it. This is so easy and good, give it a try. I love soups. I will add this recipe for next weeks menu plan. Thank you. I LOVE quick & easy recipes. Thank you for sharing! My nose has been running lately and have needed a good soup to help me feel better! I will give this one a try! Hope it makes you feel better. This looks really good, I’m going to try this! My husband will love it. Oh, how I love a good soup especially when I am under the weather and the weather outside is cold! Great recipe!